This is revival of Matthew Richardson’s 2011 production (which I missed) which was lauded for its performers but was subject to some criticism at the time for the staging. Regrettably, the production reminds one of the various stagings elsewhere of Rigoletto in recent times which place the setting either in Las Vegas, in Berlusconi’s Bunga Bunga parties, or even on the Planet of the Apes. There seems to be a continuing drive for sensationalism, or perhaps exhibitionism by theatre directors, that makes them go for cheap entertainment rather than any attempt to be truthful to the composer’s original intentions. This opera was actually Verdi’s favourite opera, and it is among the most popular for its brutal expose of contemporary exploitation of young women, as much as for its brilliantly score. 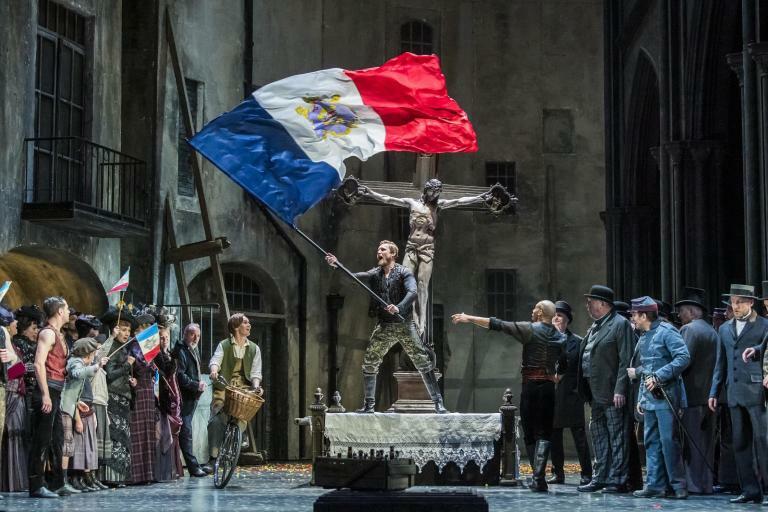 Verdi’s ever popular opera has a long history here in Scotland for it was at Glasgow’s Royal Colosseum Theatre in 1867 that Rigoletto received its Scottish premiere on the occasion of the Grand English Opera Company’s British tour. A year later with the theatre renamed the Theatre Royal, Grand Italian Opera toured the opera, on this occasion with first-class singers in Charles Santley in the main role and the Italian born composer and conductor Luigi Arditi in charge. The Carla Rosa Opera toured Scotland with the Belgian émigré Eugene Goossens conducting in 1882. Verdi’s opera continued to be a mainstay in regular tours between the World Wars, but it was perhaps the conducting of Alexander Gibson with Sadler’s Wells in Edinburgh in 1959 with a cast including Charles Craig and David Ward that became a major event leading to the foundation of Scottish Opera in 1962. The Edinburgh Festival have presented three productions with visits by Stockholm Opera in 1959, among the singers were Nicolai Gedda, and Kerstin Meyer. Renata Scotto was the Gilda in the Teatro di Maggio Musicale visit of 1969, and in 1987, Finnish National Opera brought their staging with Jorma Hynninen in the lead role. Scottish Opera’s own productions date from 1979 with Neil Shicoff and Dennis O’Neill featured along with Norma Burrowes as Gilda. The previous Rigoletto here dates from 1997 with the singers including Claire Rutter, and Boris Trajanov conducted by Richard Armstrong. Having watched a superb production of Nabucco in Naples last week, it was easy for me to come away disappointed, but the standards of performance at Scottish Opera have been favourable here in recent seasons so one had some hope of success with this season’s opening show. Verdi’s perennial front-runner brings in the audiences because of its superb musical potion of humanity, brilliant melody and song, and perhaps new audiences would have been inspirited by last year’s successful La traviata. There were however setbacks for prior to the show beginning, we were informed that the Rigoletto from Greece (making his debut here) was unwell but was still prepared bravely to go through with his performance. As it happened indeed Argiris’ performance was among the highlights, certainly for much of the three acts he managed to cope exceedingly well, only in a few moments did he falter, but his acting was superb (as it has to be if we are to enjoy an authentic performance). His clowning in the first scene was finely enacted and notably set the evening with his characterisation of the low-life womaniser. The scene when Rigoletto and the Duke of Mantua are cursed was astonishingly well executed with great acting from the Count, and the crowd scenes were superbly enacted. Throughout the role of the male chorus – not only musically but through their acting – made the whole show work as a production, the singing was not always on a high level; the Gilda of the Norwegian coloratura soprano Lina Johnson was somewhat underwhelming in her Act I ‘Caro nome’ but later, her singing in the closing act was on par with what audiences have come to expect here in recent seasons. It was her characterisation that seemed a little under par, perhaps as the production tours she will assume the difficult role in a more appropriate manner. This was also noticeable in the other roles, particularly Adam Smith’s Duke whose excellent singing of the great aria ‘La donna è mobile’ made up for his acting which were not up to the mark. Throughout this staging there was an overwhelming layer of sleazy glitter from the flashing disco lights in the dance scene to glimpses of sexual antics when doors opened, as well as, rather distasteful innuendo and overt sexuality. The production was full of cheap gimmicks, with mannequins used in the dance scene, and masks worn by the male dancers portraying their participation in kidnapping the heroine Gilda. Unfortunately, this element of cheapness has more in common with vaudeville and lowered the standards of this production, yes the libretto’s underlying victimisation of women and young girls is there in the music but it becomes a little overbearing over more than two hours. 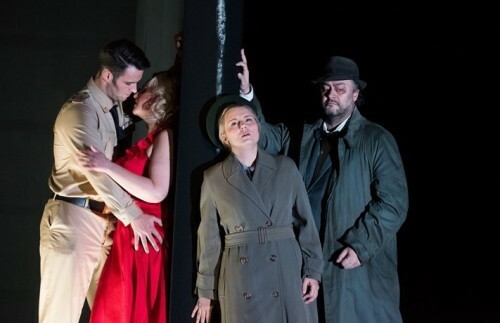 Among the successes of the opening night was the Count Monterone who was superbly performed by Stephen Gadd – a regular at Scottish Opera – his curse was intensely dramatic. The Maddalena of Sioned Gwen Davies was another major highlight, again the Welsh singer proved marvellously at one with her character in her crucial role in taking the Duke away from Gilda which leads to the final tragedy. Sparafucile was excellently drawn throughout, David Shipley looked as if has always played such spine-tingling roles on stage, both in characterisation and in voice. The whole production was choreographed immensely well, if anything this emphasised the gripping drama of the music, Kally Lloyd-Jones merits future work here. The debut here of conductor Rumon Gumba was outstanding and his conducting from – the marvellously vibrant and colourful prelude through to the dramatic end – was a major highlight, as was the wonderful brass and woodwind playing of the Orchestra of Scottish Opera. Overall, this proved a rather unsatisfactory opening to Scottish Opera’s new season, however I suspect the singing will improve in future evenings when the cast melds together and when their principal singer is fully recovered. The lesson is that companies should not be playing fast and loose with opera librettos, the scores or the plots, since the composer’s intentions should be respected above all. For more about Scottish Opera click here.